What’s better than peanut butter!? Umm how about a whole pie of peanut butter!!! 😋 Yep, you read that right – a whole glorious pie dedicated to this delicious ingredient. 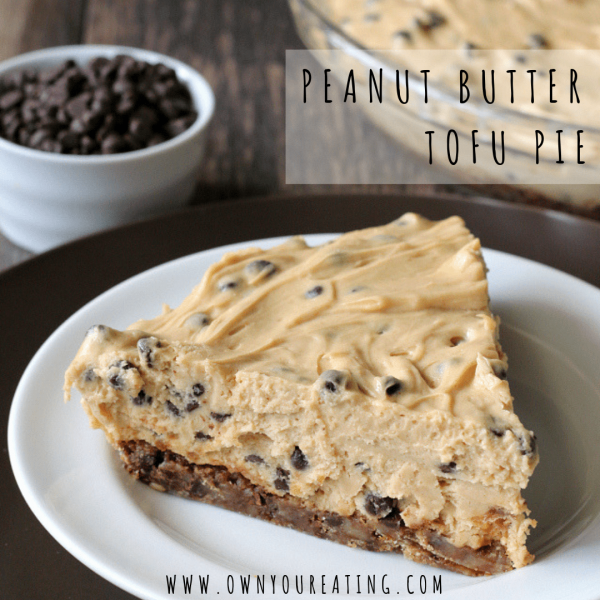 The best part is with the help of tofu and some peanut butter powder, it’s a totally macro friendly dessert – so you can have your pie and eat it too! The nutrition facts are for 1/8 of the pie with no additional toppings. But feel free to get creative to make your pie look extra special! A drizzle of melted dark chocolate or some low fat whipped cream or even tossing in some chocolate chips would all be yummy additions. Now I know the sound of tofu may have you questioning the legitimacy of how tasty this pie claims to be but don’t let it put you off. If you’re new to browsing the tofu shelf in the refrigerated section of the store, keep your eyes peeled for Nasoya Organic Silken Tofu which is often used in desserts or smoothies. It’s a great replacement for eggs too! A macro friendly peanut butter pie! Silken tofu creates a creamy base and peanut butter powder brings the flavor with way less fat! I used a small amount of real peanut butter here to add to the flavor. The crust is courtesy of Skinny Taste but a store bought one would work just as well. Enjoy! Place graham, sugar and butter into a food processor and pulse a few times. Combine tofu, peanut butter, peanut butter powder, and honey in food processor or blender and blend until smooth. Pour into crust and chill for at least 4 hours. This would be great with some chocolate chips thrown in!